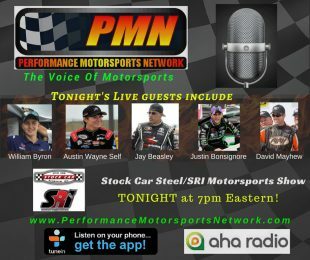 Stock Car Steel/SRI Motorsports Show Kicks Off Tonight at 7pm Eastern on PMN Radio! A five-driver guest lineup that includes NASCAR K&N East Series winner William Byron and series rookie Jay Beasley, NASCAR K&N Pro Series West Sonoma winner David Mayhew, NASCAR Whelen Modified Tour Series winner Justin Bonsignore and ARCA Series winner Austin Wayne Self will set the pace for tonight’s Stock Car Steel/SRI Motorsports Show at 7pm Eastern on the Performance Motorsports Network. Speed77 Radio/RaceChaser Online personalities Tom Baker, Kyle Magda and Aaron Bearden will co-host the two-hour show, which also looks back at the NASCAR Sonoma weekend and forward to this weekend at Daytona and NBC’s return to NASCAR national series broadcasting. The power trio will also get you caught up on all the motorsports news of the day as they focus on short-track and regional series stock car coverage. Fasten your seatbelts as the fastest short track show on the web takes a look at all the latest news from the worlds of pavement late models, modifieds and the major regional touring series! You can also chat with the hosts or leave questions for our guests on Twitter during the show @Speed77Radio. The show will also be rebroadcast on the Performance Motorsports Network on Saturday nights from 10 p.m. – midnight Eastern and the Monday following the show from 10 a.m. – 12 noon Eastern time, as well as uploaded on-demand to the RaceChaser Online YouTube Channel on Sunday for fans who are not able to listen live. Speed77 Radio is RaceChaser Online’s broadcast division and together they produce Motorsports Madness on Monday nights at 7 p.m. Eastern and the Stock Car Steel/SRI Motorsports Show on Thursday nights at 7 p.m. Eastern on the Performance Motorsports Network. Turn 5 Live is a New York-based weekly dirt-track affiliate of RaceChaser Online and Speed77 Radio, airing live on Tuesday nights at 7:30 p.m. Eastern on the Performance Motorsports Network.